Access to safe water, a golden human development indicator is challenged by daily human activities i.e., pollution attributing to deposition of wastes in form of excreta, domestic refuses and waste water into water sources (Ridderstolpe & Palmer Rivéra, 2007). In Uganda statistics indicate an increasing trend in contamination of water sources with facial coliforms (MWE, 2014). Apparently, failure of over 42% of water supplies in small towns and 47% in rural areas to comply with the national bacteriological standards for drinking water is attributed to contamination by open defecation, seepage of waste water, poor drainage and deep pit latrines (ibid, 2014 & Isunju et al, 2013). Given that a fairly large big population in the country survives below poverty line, they cannot afford wood fuel, electricity or gas to boil water before drinking. They therefore drink the water without prior treatment and end up suffering from communicable diseases. Intestinal worms and diarrhea are reported to be amongst the top 5 causes of morbidity in Uganda (MWE, 2012). Appropriate Technology Centre for Water and Sanitation (ATC), the research arm for Ministry of Water and Environment is piloting low cost point of use water treatment technologies that can be used by the population segment that cannot afford costly means of treating drinking water. 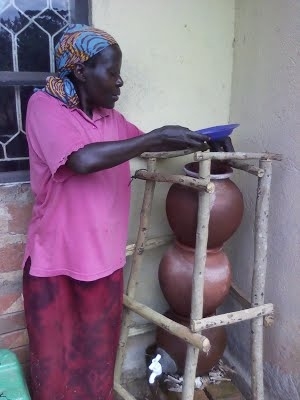 To this effect, the Three Pitcher (THREP) filter is being piloted in Kiwebwa village, Nabbaale Sub County, Mukono district in attempts to optimize access to safe drinking water. The THREP filter is a low cost technology made of three pots that are placed above each other, half filled with a filter mechanism (layers of sand, charcoal and gravel), working on principles of biosand filtration (Megh Pyne Abhiyan, 2006). If used properly, the THREP promises a reduction in lead, benzene, TTHMs (Total Trihalomethanes), Iron and microbial (Dean et al, 2010 and International Federation of Red Cross & Red Crescent Societies, 2008).